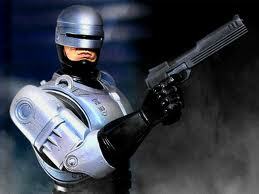 I will be checking out the remake of Robocop that opened this week. I have a personal relationship with Robocop–the original one, that is–and I want to see how this one compares. Back in the Golden Age of Starlog magazine, I used to go on one or two visits to film sets every year. Some of them were for terrific movies (Cocoon, The Dark Knight), while others were–well, not so special. But there was usually something to recommend each one of them–if not the film, then the company I’d keep (I first met Greg Nicotero on a mostly forgettable movie filming in Oregon–I won’t mention the name, but a hearty handshake to you if you can figure it out. Wonder what Greg’s doing now?). But for some reason, my editor and pal (not necessarily in that order) Dave McDonnell picked me to send to Dallas, where the first Robocop was filming with Peter Weller, Nancy Allen, and an all-around terrific cast and crew. I even had the opportunity to walk around a bit, as my hotel was fairly close to Dealey Plaza (the JFK assassination site). I interviewed director Paul Verhoeven, who made what could have been an exploitative action flick into a brilliant bit of social commentary, as well as Peter Weller, though he wasn’t in the Robosuit at the time. We were on the upper floor of a steel and glass building where they were filming a boardroom scene, and we got to see the huge ED-209 life-sized model that would play a large part in that particular scene. Although I’ve been on dozens of film sets, for some reason I have a hard time remembering many of the scenes where I was present–not just for Robocop, but for more than half of them. I don’t remember what I saw them filming for Robocop 2 and Robocop 3, though if I read the subsequent articles in Starlog, I’m sure they’d come to mind. Instead, I remember little things, like Peter Weller gushing over the man who coached his movements, and whom he generously credited with helping him create the character. Weller did the two films and was then replaced in Robocop 3 by Robert John Burke, a talented actor and all around nice guy. In fact, after I got home, I received a thank-you postcard from him. Of the hundreds of people I’ve interviewed, he’s still the only one who ever sent me a thank you. Not that I expect it, or do it because I’m looking for a thank you, but hey–what a classy gesture. And so, I’ll be watching the newest iteration of the cyborg lawman with great interest, and I wish them luck. But the original Robo–well, we’ll always have Dallas. This entry was posted in Uncategorized and tagged Cocoon, Dallas, Dark Knight, David McDonnell, Greg Nicotero, JFK assassination, Nancy Allen, Paul Verhoeven, Peter Weller, Robocop, Starlog on February 14, 2014 by howardjohnson1985.